My adventures from the beginning stages of becoming a pastry chef to a full-fledged pastry chef. Well, I’m finished with Baking and Pastry school, and decided I wanted to get back to this blog. I’ve missed it, but going to school, then doing my externship, and entering the working world has been a challenge for me. I’m 49, am married and have been a stay-at-home mom for the last 23 years. It’s hard, but I’m grateful for each day I get the privilege of waking up. I have more aches and pains, and move slower than my younger classmates, but they keep me young, and I love the friendships that I’ve made with them and many of the chef instructors, too. So, what to say about this recipe? Wow! What a great and easy dinner! If you cut your onions ahead of time and buy pre-sliced mushrooms it’ll be even faster. 2 (8-oz) packages fresh sliced mushrooms. I prefer baby Bellas! 1.75 pound flank steak cut into thin strips across the grain. 1. Prepare noodles according to package directions. 2. Heat oil and butter in a large skillet. You don’t have to use butter, but I think it gives it great flavor. 3. Season beef with S&P. I also used onion powder. Sauté the strips. Do them in batches if you need to prevent overcrowding. Brown quickly on both sides, about 1-2 minutes per side over medium-high heat. Remove and Set aside. 4. Add mushrooms, onion and garlic to skillet. Cook over medium heat, stirring frequently, until vegetables are almost tender. Add 2TBLS of the flour and cook for a couple minutes. Remove and add to beef. 5. Combine sour cream, tomato paste, paprika and remaining 2 TBLS flour in a bowl. Pour about 1/2 cup of the hot broth into the sour cream mixture, and stir well. Pour the sour cream mixture back into the skillet, and cook over low heat, stirring constantly, until slightly thickened. Stir in reserved beef/mushroom mixture and heat through, Just a couple minutes. 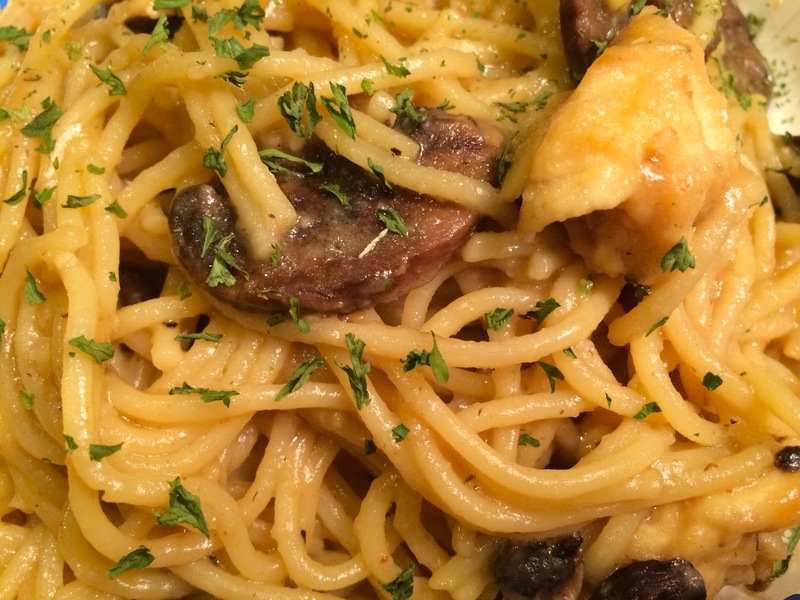 Serve over noodles, and garnish with chopped fresh parsley. Returned the chicken the pan and lit it simmer for a couple of minutes. We learned how to make risotto the “real” way this week in culinary school. Risotto sort of gets a bad rap for being pretty labor intensive, but really it only adds about an extra 10 minutes or so of standing there monitoring it and adding liquid 1/2 cup at a time. Some add 1 cup, but I add less and also cook on a lower temperature. The reason is that it enables the starches in the rice to come out slowly, creating a creamy texture, and not simply mush, which is pretty much what you’ll get if you add all the liquid at once or too quickly. I use Arborio rice. It is an Italian short-grain rice. This is a perfect rice for risotto due to its high amylopectin starch content. 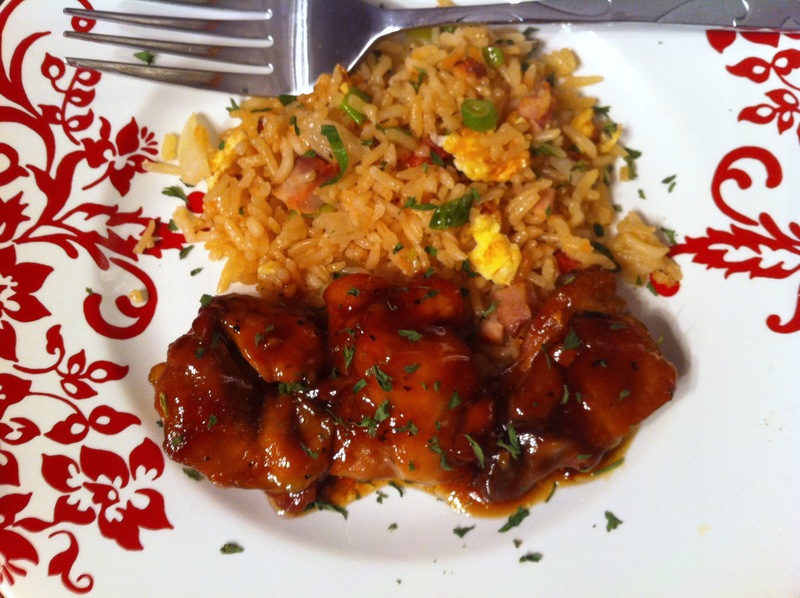 Rices with a high starch content taste “starchy.” However, they blend really well with other flavors which covers it. That is why wine, and broth work beautifully with risotto, and not water. If you can’t find arborio you can substitute another short or medium grain rice with a high starch content. I’ve heard that white sushi rice works well, but I haven’t tried it. Add rice and stir, then cook for a few minutes. You are trying to toast the rice. Basically, doing this keeps the starches from coming out too quickly and ruining the texture of your risotto. Now, add your wine and wait a minute or two until it’s absorbed. Yes, stir it. Keep adding and stirring your liquid 1/2 cup at a time, waiting for each to be absorbed before adding the next. By the time you’ve added all the broth your rice is done. This takes about 20 minutes. No need to set a timer really. My stove is electric <groan> and I kept it set on 5 once I added the rice, after sautéing. Once your rice is done, add mushrooms, parsley and cheese. 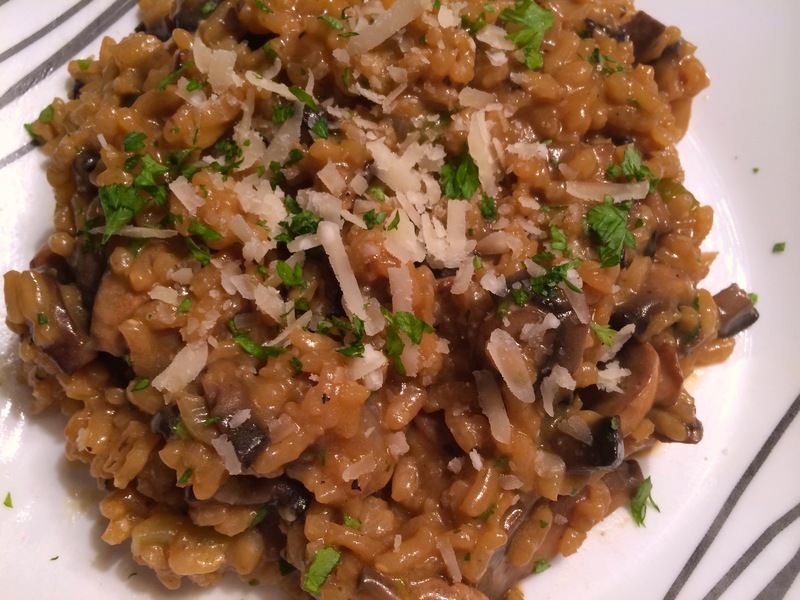 Save a little parsley and cheese to garnish your yummy risotto. My kids were begging for third helpings, but I told them I needed to pack some for my daughter’s lunch tomorrow. My son was NOT pleased… LOL. 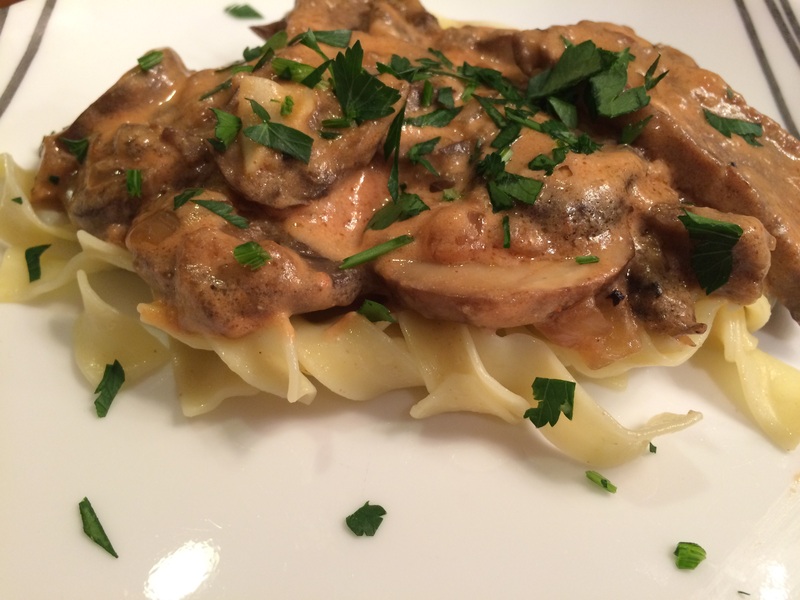 This is a family favorite and we make it at least once a month if not more. It’s soooo good. This makes a lot of sauce, but my kids like it that way. You can use less sugar, but I really think it needs it. Adjust to your taste though. Cleanup is a breeze if you line your baking pan with foil. Seriously, do it. Serve with some homemade fried rice; it’s super-easy. When making fried rice it is important to use cold rice, leftover white rice is ideal. I’ll post my fried rice recipe in another post soon. Tonight’s dinner goes back to my Southern girl roots. 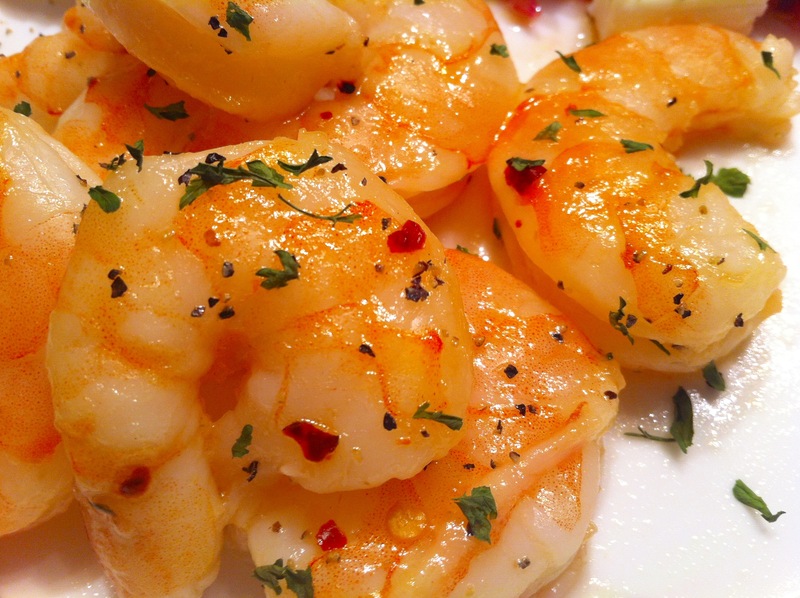 Being brought up in Texas near the Gulf of Mexico we always had lots of shrimp. I started out with a 2 lb. bag of jumbo, frozen, raw, deveined and easy-peel shrimp. They were even on sale so I stocked up a few more bags in the garage freezer. The recipe I used is HERE. I skipped the part about using egg and panko because I didn’t have any. I added a package of Italian seasoning mix to the flour in addition to the cajun seasoning. You can use Old Bay if you don’t have anything else. So, pretty much just the flour mixture and then fried. squirt from lime juice container. It came pretty darn close to tasting like the real from-scratch recipes. First I combined 4 TBL of butter with 1 tsp of minced garlic and melted in microwave. Next I buttered a roll and toasted it. Meanwhile, I coated the shrimp and fried them up. 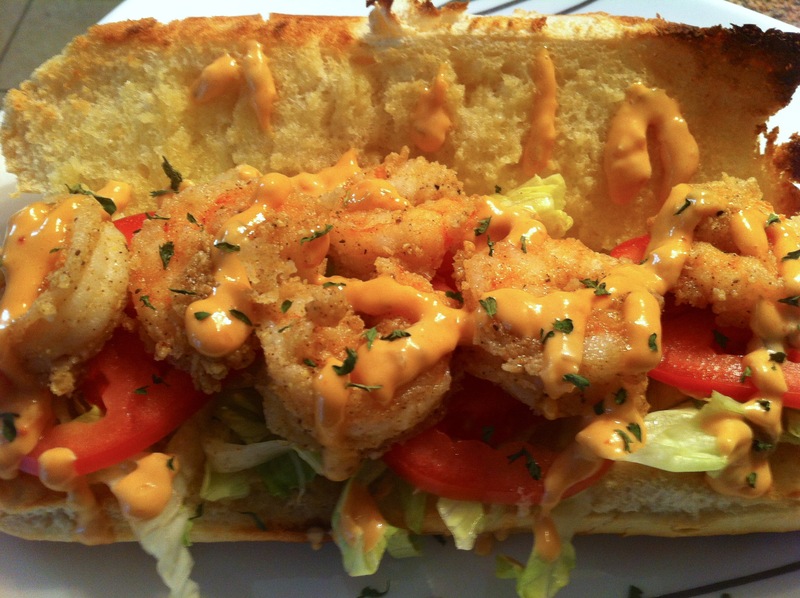 Next, I put shredded lettuce and tomato slices on the toasted roll and then put on the cooked shrimp. Finally, I drizzled with the remoulade sauce. YUMMY… so good. My kids said it was fantastic. I had the most unusual craving tonight. 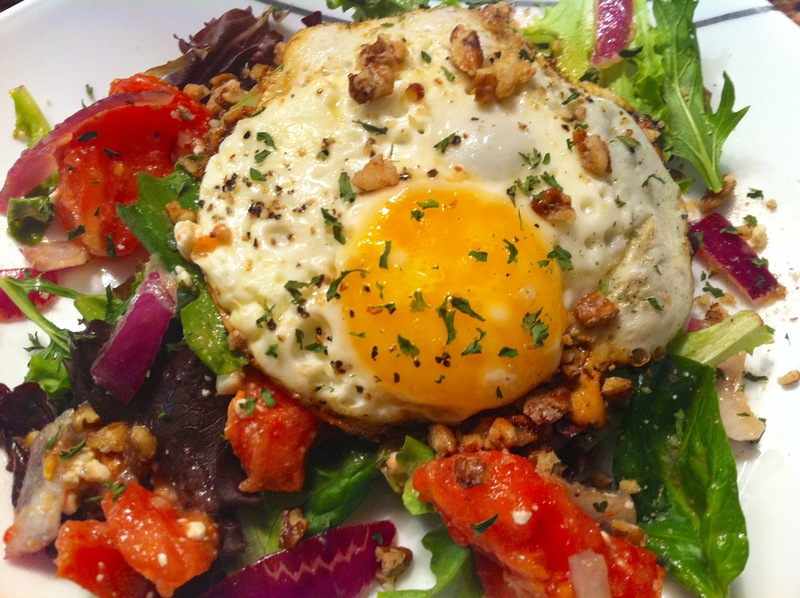 I was craving a fried egg on a salad. Strange, I know. I don’t ever remember seeing one before, but it just flew into my head as I was getting ready to prepare dinner. I had already marinated some locally-grown heirloom tomatoes and red onions in oil, red wine vinegar, garlic, dab brown mustard, salt, pepper and a dash of sugar. I decided to toss some lettuce in with it, threw in some bleu cheese crumbles and added some of my candied pecans I had leftover from another recipe earlier in the week. Then, it was simply a matter of frying an egg and placing it on top. It was runny; it had to be. That’s what I was craving. Good grief, someone help me… LOL. The verdict is that it is FABULOUSLY delicious. My teen daughter gives it two-thumbs up. Yay. Jumbo shrimp peeled and deveined and marinated for about an hour in about 1/2 cup olive oil, juice from 2 nice sized limes, 4-5 TBL honey, minced garlic (I put in two cloves), salt and pepper to taste. I roasted them on a foil-lined baking sheet in a 425F convection oven for about 6 minutes. I put some pepper flakes on my daughter’s portion when I took them out since she likes things a bit spicy. priscillazorn on Happy Fall, y’all! robintnelson on Happy Fall, y’all!